Feeling mixed emotions on ANZAC Day. 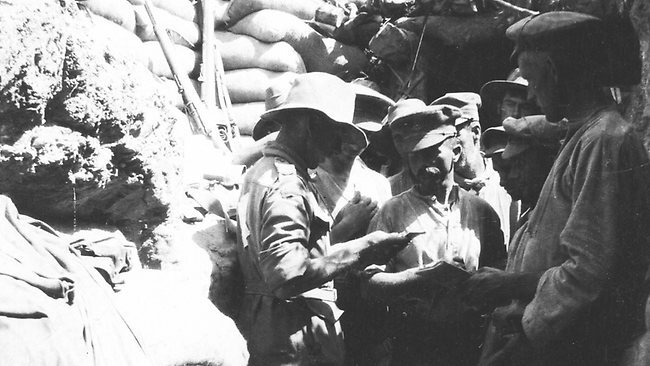 This recently discovered photos of Aussies in the trenches in World War 1 brings another special memory to ANZAC Day celebrations this year in Melbourne. I’ve just finished watching the ANZAC Day parade here in Melbourne and how the next generations of Australians in their thousands come to pay their respects to not only those who “diggers” who march but also those who paid the ultimate sacrifice. Its with uneasy mixed emotions now that I remember as an 18 year old about to enter university how I celebrated when Whitlam in 1972 ended national serviceor conscription as it was known for 20 year olds to serve in the Vietnam War. Many men served and died in that, what was to become an unpopular war by the 1970’s and I felt relief at not having to be called up. I remember getting into fierce arguments in a few bars at the time when I expressed that relief. Now days the relief I felt then and to be truthful still do is mixed with sadness for the many who suffered and died and yes pride for those who did serve. I did say unease and mixed emotions. I remember as a child going to one of my grandmothers homes and discovering a world war 1 helmet in the back shed. Naturally it seemed in those days in the late 1950’s my brothers and I played a war game, running around an overgrown backyard hiding, shooting and taking turns to wear the helmet. The joy of playing war as a child was replaced I think with a fear of the reality of having to go to war. My children didn’t play these games and I wonder is this a reflection on my own mixed feelings. Anyway I watch the parade with pride for those brave men and women who served and I wonder what became of that helmet. Previous Previous post: Principal’s can graduate too! Happy to chat about mixed feeling.